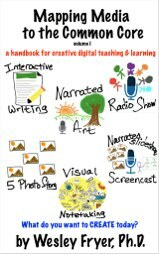 Digital storytelling involves a process of planning, producing, editing, and publishing. Create a “channel website” for your classroom to share digital storytelling videos online. An educational YouTube channel or Vimeo channel can be an excellent virtual space for sharing digital stories. Alan Levine’s website, “50 Ways to Tell a Web 2.0 Story” includes outstanding resources and process suggestions for digital storytelling. 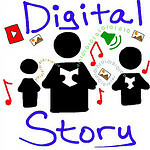 Storychasers maintains a helpful resource wiki for digital storytelling. Jason Ohler offers excellent resources on digital storytelling. Bernajean Porter’s Storykeeper‘s Resources website is exellent, along with her Digital Media Scoring Guides on DigiTales. Story Wheel ($3 iOS app) is a storytelling app which lets users narrate randomly selected images. This app can’t be used for digital storytelling in the same way apps like iMovie can, but it’s a great app to get kids creatively inventing stories. These are amazing resources and thankyou for sharing your wisdom with the masses!! I look forward to meeting you in the digital world over the next few years, all the best! Thanks for the price update, I changed it on the page!